During the development of East Lothian Community Hospital, the physiotherapy team based at Roodlands needed a space to continue to provide much needed rehabilitative in-patient care. The £70 million development will create a modern, purpose-built hospital on the existing Roodlands Hospital site and is expected to be fully open by early 2020. As deconstruction work began on the existing Roodlands building, in-patient rehabilitation was able to continue thanks to the interim physiotherapy suite provided by Portakabin. The modular building was installed in just one day to reduce further disruption to the busy hospital site and will be in place for two years. The building has created much needed space including an open plan office, storage room, hallway, toilets as well as an open plan treatment room to provide on-going physiotherapy care throughout the development on site. 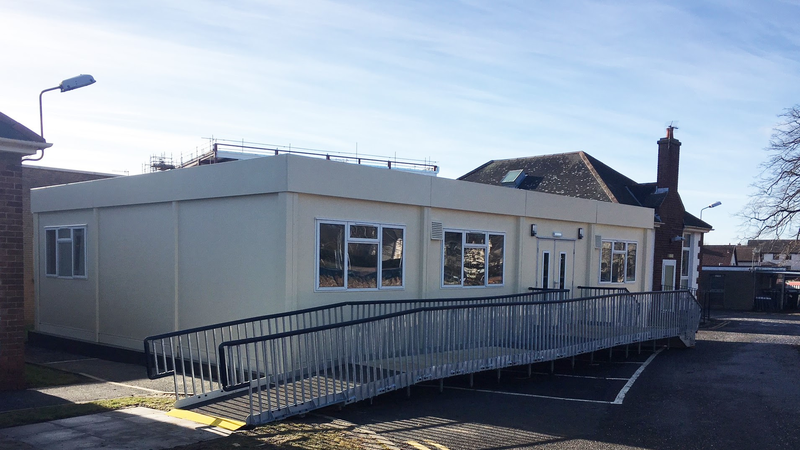 In addition to providing the building, Portakabin installed hospital-grade skirting boards, a fully DDA compliant access ramp and a safety alarm system. The team at Portakabin also assisted the hospital trust in gaining planning permission and providing a building warrant for the duration of the hire to ensure there was no disruption to patient care.